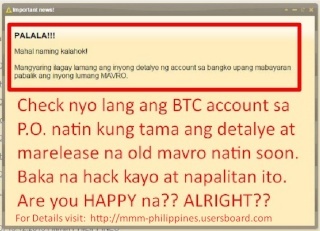 Check BTC Account for payment of old mavro. Post Reply or Comment to see the instruction what to do or how to check it. Di pa po yan lumabas sa PO ko. Selected users pa lang siguro. Anyway, I am happy na! Alright!! !